Red Tiger have made a leap into uncharted territory with their revolutionary Laser Fruit slot, although first appearances may suggest otherwise. Their usual output are typically 10 or 20-line games of which half consist of Oriental themes such as Jade Charms and Golden Lotus but here we get what looks like a retro 243-way game but which packs an almighty punch as we will see! 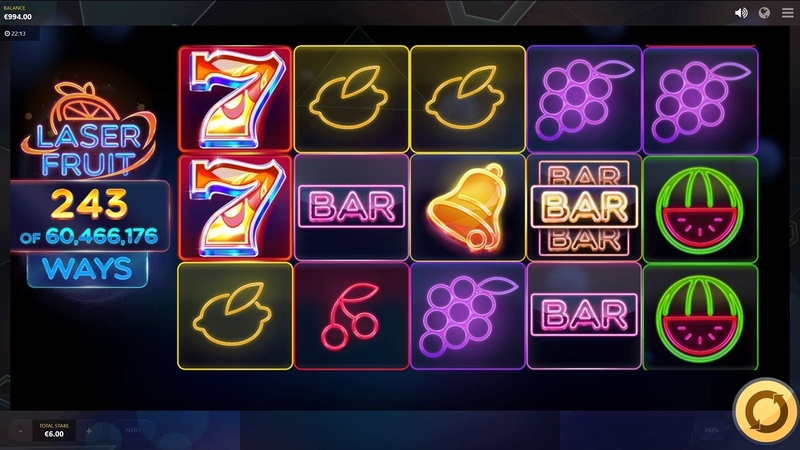 I would suggest Laser Fruit slot is their answer to Big Time Gaming's volatile Megaways series including Bonanza, White Rabbit and Extra Chilli and if it's all about 'ways' then Red Tiger certainly have the edge as the grid has the potential to expand in the bonus to an insane 10 reels of 6 rows each, or for those that like stats that is up to 60,466,176 ways in play! Your first impression will be of the basic graphics which are old style icons such as lemons, cherries and bars all depicted in neon over a black background. The music is equally basic although we keep the traditional Red Tiger sounds as the reels stop and we have only 9 symbols which can appear stacked in doubles and triples too. The 7's pay the best at 6x bet for a 5-of-a-kind win right down to the lowly cherries at a paltry 0.5x. This is moot though as there are also pays listed for 6 to 10-of-a-kinds which are substantially higher so those highest and lowest examples above become 25x and 6x for a way of 10 symbols. The obvious question is how do we get to see these increased possible pays? In the base game you will see a blue laser light flashing through the lines between each of the 15 tiles in view during each spin and sometimes these can transform into arrows pointing either upwards or rightwards on any one or more tiles. So if an arrow appears anywhere on the first reel and points upwards then this reel will grow by one symbol before any pays are calculated. An arrow on the same first reel pointing rightwards will increase that row by one symbol in the same way. This can lead to some odd-looking reel grids and numbers of ways and you can get multiple arrows in one spin, even the same tile with both the upward and rightward arrow at once. These random in-play configurations can be quite exciting though and produce some decent hits to maintain your balance, always a benefit if you have a volatile game which is heavily dependent on the feature returns. There is just the one feature round triggered by 3 or more free spin icons anywhere in view. No pay for the scatters but you will see a wheel spin which will stop on a minimum of 8 to a maximum of 50 spins, with many values in between such as 17, 23, 40 etc. 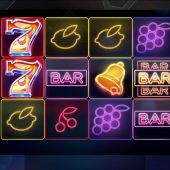 I think you may have guessed the enhancement applied to these free spins already, but if not it is simply that all expansions upwards and rightwards become 'sticky' for the remainder of the bonus round. This leads to some very strange asymmetric reel configurations and the game displays the latest calculation of the ways you have accrued at that point. Re-triggers are quite common and will simply spin the number reel again. No row can extend beyond 10 icons nor a column beyond 6 so when one is extended fully any laser arrow will automatically expand in the direction where there is room for expansion.